This country’s travel industry has bid farewell to the man who has most prominently carried the flag in Canada for India’s tourism trade over the past three years. 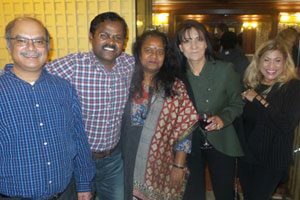 A Thursday night Toronto gathering paid tribute to Anil Oraw, who has been the senior figure in India Tourism’s Toronto office. Oraw is heading back to India Tourism’s head office after a tenure that included a rise in the number of Canadians visiting his homeland and improved air links between Canada and India. The Toronto gathering saw a cross-section of the tourism trade praise Oraw for his energetic efforts to promote India. There was no immediate word on a possible successor here to him. Seen here are India Tourism’s Eugene Correa; Oraw; Oraw’s wife; Sue Kaila of PanEx Travels & Tours; and Liz Mandol of Total Advantage Travel & Tours.